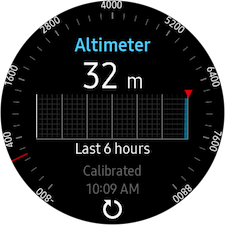 The altitude and barometric pressure sensors in your Gear S3 can quickly tell you how far you are above sea level and the current atmospheric pressure. In addition to the Alti-Barometer app on your Gear S3, you can set up the Alti-Barometer widget on your Home screens. The provided information refers to the devices sold in Canada. The screens and steps shown below may vary by wireless service provider and your mobile device. 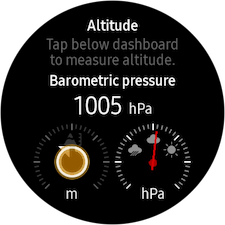 1 From the Watch screen, rotate the bezel to the right until you reach the Altitude and Barometric pressure widget. 2 Touch the bottom-left icon to open the altitude sensor. 3 Touch GO to calibrate the altitude sensor for the first time. Review the disclosure and touch the check mark to continue, if required. 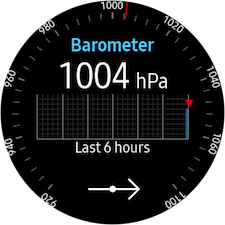 4 Once the Altimeter is set, rotate the bezel clockwise to view the Barometer. You can recalibrate the sensor at any time by touching the Recalibrate icon at the bottom of the screen. 5 Rotate the bezel clockwise again to access the settings menu. 6 Touch CHANGE to adjust the settings. Touch the question mark for more information on how the altitude and barometric pressure are calculated. 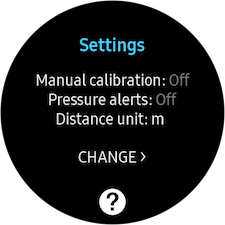 7 In the settings menu, you can manually calibrate the altitude and sea level pressure, and change the distance and pressure units. 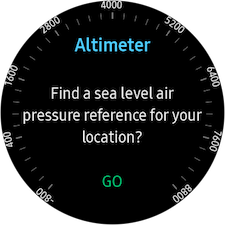 You can also turn on pressure alerts, which will notify you when the atmospheric pressure drops more than 4 hPa in a 3-hour period.